Our customers can avail Jam Filling Machine from us. The offered range of jam filling machines is available in number of customized grades and allied specifications in accordance with the diverse requirements of esteemed clients. Moreover, the offered range of jam filling machines is checked on different characteristics to maintain its authenticity throughout the designing process. 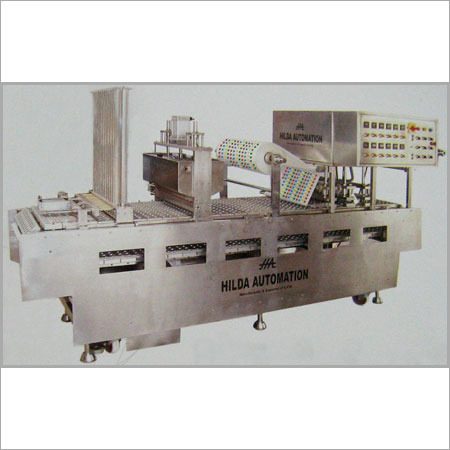 In the wake of the ever rising demand for reliable products, we, Hilda Automation are engaged in manufacturing, supplying and exporting a wide assortment of Machines since 2003 across the Indian Subcontinent. The wide range of products offered by us include Linear 2 Head/Nozzle Cup Rinsing Filling & Sealing Machine, Automatic Bottle Rinsing Filling and Capping Machine, Automatic BOPP Labeling Machine, Automatic Jar Rinsing Filling and Capping Machine with Shrink Tunnel, Sleeve Applicator. Also, we are engaged in offering the most sought after range of Automatic Neck Sleeve Applicator, Sleeve Cutting Machine, Shrink Tunnel, 6 Head Filling & Sealing Machine, Filling Machines With NRV system, Crown Capping Machine and Semi Automatic Sealing Machine. Banking on our enriched industry experience, we are able to understand the different packaging needs of various industries and offer reliable range of products. These products are designed and developed in line with the latest trends and standards set by the industry.